I'm perfectly capable of making myself sick without your help, Nabisco. Available for a limited time only, Oreo's Mega Stuff cookies are an answer to the marketing-powered imaginary war going on between fans who enjoy Oreos for the cookie, and those who prefer the creme in the middle. Which side will come out on top? The answer is obvious — neither, leaning towards cookie. Why? Because I could see someone paying a couple of bucks for plain chocolate cookie wafers with 'Oreo' stamped on them. No one is going to buy a Pillsbury cookie dough-sized cylinder of creme. The joy of the Oreo is the balance achieved between the two sides. Without cookie there is no point to creme. Without creme there's barely a reason for cookie. "But what about the people who buy Oreo Double Stuf?" asks the marketing generals. "They obviously want more creme." No, what they want is novelty, and they don't mind paying the same amount for less Oreos to get it. If they wanted more creme, they'd do what Oreos eaters have been doing since the dawn of time — building their own damn cookies. A Double Stuf is just two twists and a smoosh away in a package of normal Oreos. If one were feeling really daring, one could combine two Double Stuf cookies together into one Mega Stuf cookie. Eating more than a couple of those will make a person feel like they want to die, but at least they'll be craving death by their own hands. The Oreo modding community is a proud community, one with dreams as big as their medical bills. They don't need you to meddle in their work, Nabisco, especially if you're just going to make a mess of it. That's just sloppy. 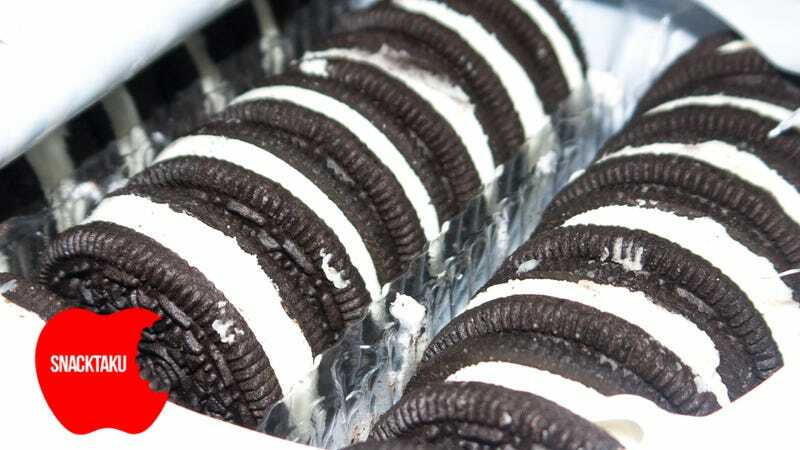 Though you can't see it in this photo, each Mega Stuf cookie features a visible seam between the two halves of creme. It looks like these were put together by hand. That's insult on top of injury. We have our own hands, Nabisco, and if we want to use them to make ourselves vomit sugar lard that's our prerogative.